REDICO is a local real estate development and investment company based out of Southfield, Michigan. They’ve been a recognized national leader in commercial real estate for over 50 years. In 2016, the REDICO team came to the conclusion that they needed to redesign and develop their new corporate website. Their previous Joomla-based website was outdated, difficult to manage and update, and didn’t feature in detail their real estate properties. Because it was designed and built years ago, the old site was not mobile friendly. With a need to stay competitive in a growing market, REDICO turned to us for help. First, we took a look at their competitors and performed a benchmarking study that highlighted what others in their sector were doing and the overall website trends for their industry. This not only allowed us to determine what REDICO needed to do to stay competitive, but it also helped us identify what REDICO could do differently to stand out from their competition. Next, we reviewed their current website traffic and ranking with an analytic report and conducted an AMA (Audience, Message, Action) brainstorming session to determine how to focus the new website. At REDICO’s AMA session we extracted information from key stakeholders, team members, and tenants of REDICO properties. With this information, we had a clearer picture of what the new REDICO website needed to look like, what information should be included, and how it should function to serve its users. 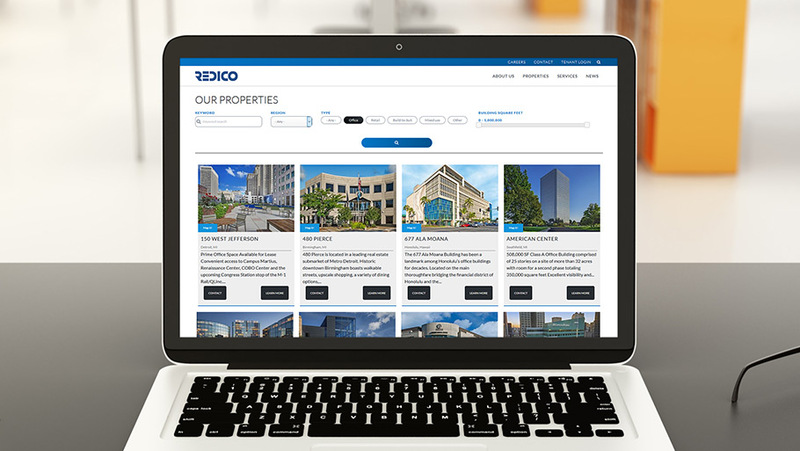 A new approach to design was crucial to this redevelopment because it had been years since the REDICO website had been refreshed. With input from the REDICO graphics team, our designers created multiple design options that included new typeface and color palette. In addition to the design refresh, we helped write content and SEO (Search Engine Optimization) for the website. The client wanted to move away from their previous Joomla platform to one with more support and that is widely accepted. Based off their needs we recommended Drupal as their new CMS platform. We also host the new REDICO website and provide the client with CMS maintenance and support. The entire Media Genesis team was fantastic to work with throughout our entire web redesign project – and beyond. The MG project management staff functions as a well-oiled machine. They were responsive, communicative and nimble when it came to every aspect of our project. The web design team listened to our feedback and developed a site that was functional, aesthetically pleasing and visually represented what we do in our industry. I was so impressed with their work and capabilities, I have already recommended them to others.